This is an evergreen coniferous species of tree that can be 50 m tall or taller. Tree to 50 m tall, sometimes taller; bark thin, grey and smooth when young, developing into small, squarish scales, greyish where flakes exposed, cinnamon brown underneath; young twigs puberulent. Needles in fives, (3) 5-10 cm long; light blue-green. 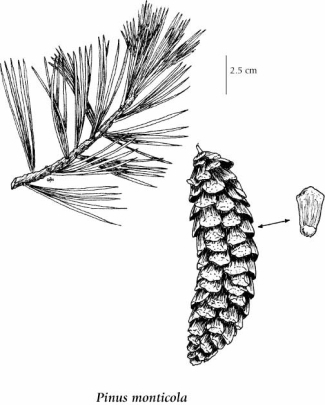 Seed cones pendant at ends of upper branches, yellow-green to purple when young, turning yellowish-brown, 15-25 cm long when mature; scales thin; pollen cones yellow, clustered. Moist to dry slopes in the lowland and montane zones; frequent in S BC; E to SW AB and S to CA, NV, ID, and MT. 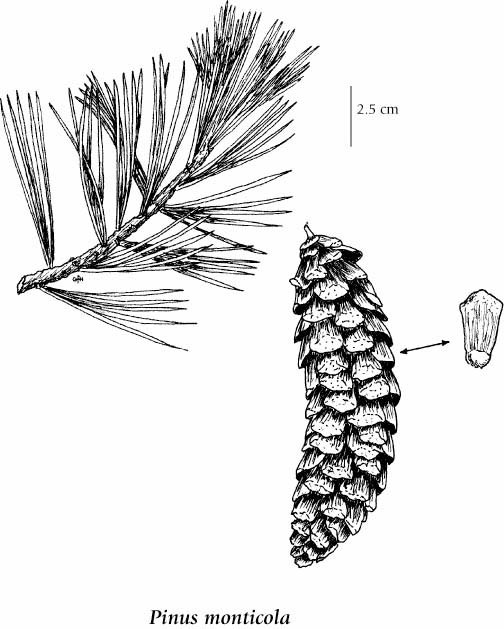 Pinus strobus var. monticola (Douglas ex D. Don) Nutt.